Jean Perras supervised activities at the site and worked with the authors, editors and ASCSA Princeton publication office on preparation of The Bridge of the Untiring Sea’: the Corinthian Isthmus from the Bronze Age to Late Antiquity” eds. E. R. Gebhard and T. E. Gregory, forthcoming as Hesperia Suppl.47. Angeliki Kandri completed recording of objects on shelves in the apotheke. 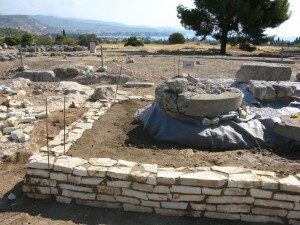 The photographic record and a copy of the site data base were submitted to ASCSA, as requested by ΛΖ Eforeia on behalf of the Ministry of Culture. Jonida Martini began in May as apotheke assistant. She is revising records of the metal Lots (bronze, iron, lead), digitizing the records, and reorganizing their storage. Evgenia Doschori (draughtsperson) began about 1,500 profiles for publication of the Classical pottery by Martha Risser. Conservation is under A. Kandri. Conservation within the Archaic Temple: A. Kandri assisted by Nicholos Rothones mended and stabilized the base for the Archaic perirrhanterion according to plans by Frederick Hemans, approved by the Ministry of Culture. 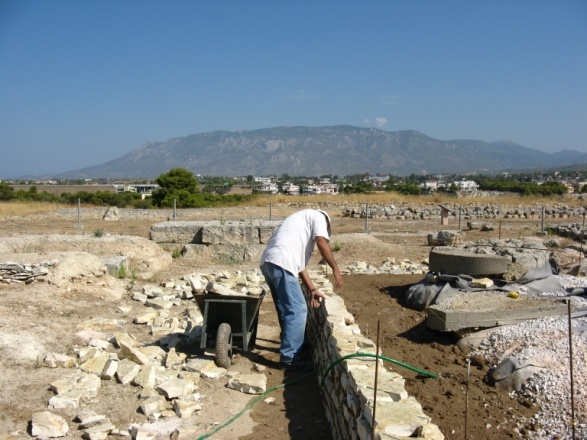 Geocloth was laid down followed by construction of a low wall to prevent erosion of deposits related to the Archaic base. 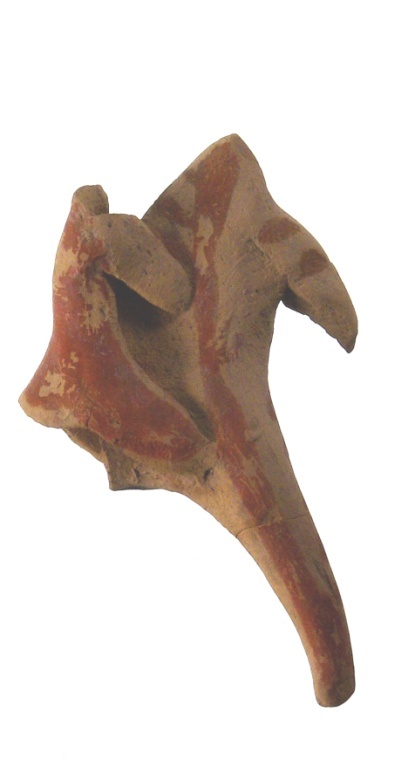 Dr. Thomsen identified a second “core group” of horse-and-rider figurines that is probably earlier than the “Asklepieion Group” of the 3rd quarter of the 6th century B.C. and named it the “High-Arching Tail Group”. A date in the second quarter or middle of the 6th century B.C. seems reasonable. Other figurines can be connected around these groups, and finally an overview of the major group of High Archaic figurines has emerged. Beginning with the construction of the Archaic temple ca. 650 B.C., figurines increase during the second half of the century and again towards the middle of the 6th century when the Isthmian Games gain Panhellenic status. The series ends in the early 4th century B.C. since hardly any figurine must be dated after burning of the Classical temple in 390 B.C. 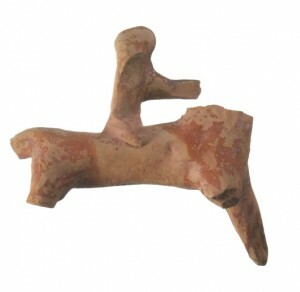 The usual practice of devoting terracotta figurines, represented by the most common horse-and-riders, terminates. Only in small numbers and for a limited time are they replaced by other types. It remains as an intriguing question, why the practice of giving terracotta figurines does not reawake with refurbishment of the sanctuary in Early Hellenistic times, and why there are virtually no figurines associated with renewal of the games in Roman times. Hellenistic and Roman figurines are prominent in many other sanctuaries, prompting the question: is the lack of them in Isthmia connected with the particular type of cult practice? Late Archaic and Classical Pottery, ca. 550-300 B.C. Martha Risser, students Amanda Keyko, Christina Mitropoulos, Trinity College. A main area of work dealt with Attic fine wares with attention to K. Lynch’s The Symposium in Context: Pottery from a Late Archaic House near the Athenian Agora. Hesperia Suppl., 46, 2011. 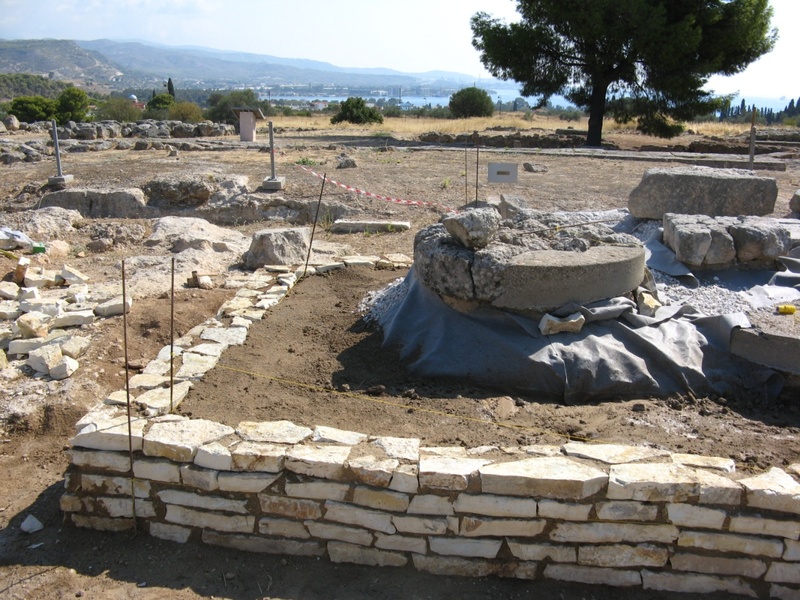 The Agora well and the Archaic Reservoir at Isthmia are contemporary dining-related deposits. Although the former is from an Athenian private home and the latter from a panhellenic sanctuary in the Corinthia both contained drinking vessels that originated in the same Athenian workshops. Editing of the manuscript and description of deposits by E. Gebhard neared completion. Submission scheduled for 2013.